HG's Official At-Work Survival Guide! Step Up Your Sandwich Game - If you love to sink your teeth into a sandwich, there are options that are both guilt-free and creative. (No one wants a boring lunch.) Light bread is good, but try 100-calorie sandwich rolls -- Arnold/Brownberry/Oroweat Sandwich Thins come in rockin' varieties like Seedless Rye and Honey Wheat. Looking to go low-carb? Load your sandwich goodies into big leaves of lettuce or cabbage! When it comes to deli meat, we're in serious love with Boar's Head -- everything from Chipotle Chicken Breast to lower-sodium turkey breast. Single-serve tuna pouches by StarKist also rule. Just assemble your sandwich right before you eat it to avoid a soggy situation. Click here for more sandwich tips, and click here for our Brown Bag Makeover email! Assemble a Salad - The name of the game is ready-to-eat protein. In addition to the options called out above, allow us to introduce you to the Tyson Grilled & Ready line. Take your pick, from diced chicken to steak strips! Also good are canned beans and veggie burgers. Put your protein over greens (we heart chopped romaine), and add your favorite veggies (fresh, canned, or thawed from frozen). When it comes to guilt-free dressing, Newman's Own Sesame Ginger dressing is an HG fave. Then you can a) stock up on containers with dressing compartments, like this smart pick, b) follow this genius mini-bottle tip, or c) find a place in the office fridge to stash a bottle with your name on it! Grab-n-Go Market Finds - No time to assemble a meal in the morning? Click here for some great grocery-store lunch finds, from frozen to shelf-stable, followed by HG advice on common lunch dilemmas! Make-Ahead Recipes - Like to plan ahead? These two recipes were developed specifically for this purpose. And scoopable salads are perfect make-ahead midday options. Try this fruity chicken or this tangy tuna recipe -- plain, on light bread (toast the bread; pack separately), or over lettuce. Click here for even more make-ahead ideas for any time of day. 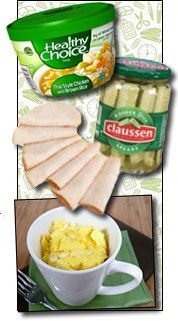 DO review our classic emergency snack lists! Click here and here for our top picks. Then print 'em and visit the supermarket, lists in hand! DO have a solid supply of shelf-stable snacks. This is super important if fridge space is limited (or nonexistent). Don't be at the mercy of the vending machine. Click here for some awesome desk-snack ideas! DON'T forget to eat breakfast. It's SO important. Studies show you're likely to take in fewer calories overall if you consume a morning meal. How is this snack related? Chances are you'll be less likely to overdo it on between-meal office munching! DO prioritize portion control. Either divvy up your snacks at home (in sealable bags or containers), or keep a mid-sized bowl on hand and dole out a single portion. Click here for our DIY 100-Calorie Packs email! DO stock up on snacks that are legitimately filling. Keywords: protein and fiber. Think jerky, nuts, protein bars, etc. See the emergency snack lists referenced above for specifics! DON'T forget about the fridge! If you're lucky enough to have access to a refrigerator, take advantage of the opportunity to stash fat-free yogurt, light cheese snacks, and more. Don't forget to put your name on 'em! DO drink lots of water. This can cut down on both sippable calories (so long, soda) and overall snacking, since we often think we're hungry when we're actually a little dehydrated. Soup - Keep microwavable bowls and instant soup packets on hand. This is a GREAT way to satisfy that nagging post-lunch, pre-dinner hunger. Click for great soup finds. Deli meat and other sandwich-associated proteins - Protein is a great tool for squashing snack cravings. Yes, even without bread. Try wrapping turkey slices around pickles, or enjoy some seasoned tuna (like this HG favorite) straight from the pouch! Egg mugs - Have access to a refrigerator and a microwave? GREAT! You'll need a microwave-safe mug, nonstick spray, fat-free liquid egg substitute, and wedges of The Laughing Cow Light cheese. Check out this recipe for our Egg Mug Classic, and make a hot snack under 100 calories! Click here for tons of info from the "Pick Me Up!" episode of Hungry Girl -- recipes, market finds, and more! And give a listen to the "At the Office" section of the HG audiobook, Hungry Girl The Official Survival Guides! Be the workplace hero... Click "Send to a Friend" to pass around this email! If you got gumdrops yesterday for Valentine's Day, don't be confused -- your pal was just thinking ahead. Today, February 15th, is National Gumdrop Day!